I almost feel bad about not having shared this with you earlier. Let me make it up to you by sharing it with you now. I bought this one when the price was $32- now it's $36, but lemme tell ya, it's still worth it. It allows you to replace a starchy base with a raw vegetable base in a more creative way than a bed of lettuce. It takes me less time to spiralize a zucchini (or carrot, or apple, or onion) than it does to chop and wash a head of romaine, and DEFINITELY less time than it takes to boil pasta or make rice. "Zoodles" (zucchini noodles) are the most popular way to use this tool- just type that into Pinterest and prepare to be inundated with zoodle recipes galore. 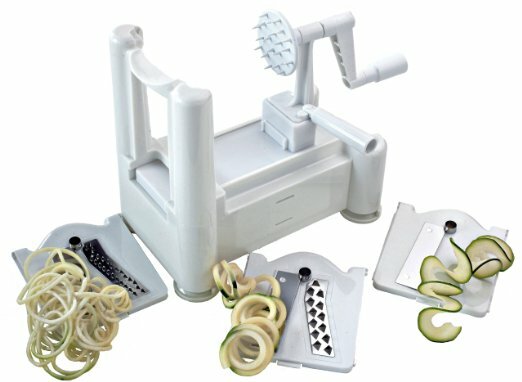 Just about any fruit or vegetable can go through a spiralizer, but it needs to be sturdy enough to not just mush up- so, berries and tomatoes are out. You can spiralize a sweet potato or a rutabaga and make a breakfast hash, or better yet some baked french fries. It chops cabbage, it slices onions, it makes uniform thin cuts of an apple, it's just wonderful. Seriously, AFTER MY VITAMIX DUH, this is one of the best kitchen gadgets I own, and one of the most frequently used, too. I'm going to share a few recipe favorites this week, so stay tuned!